NoHoPalooza with LA Best Indie Bands! Have you ever dreamt about your perfect lineup? You could visualize the perfect group of bands (or solo singers), and sometimes you could even see the perfect venue. And it was perfect mix which equals an evening of musical bliss with friends and beer. 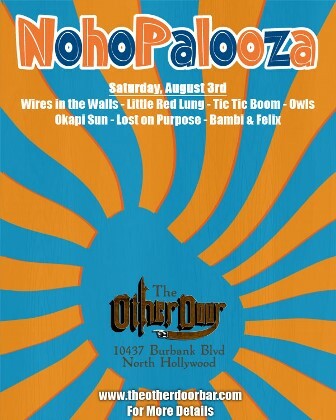 Well party people my perfect show is about to happen…..that’s right Wires In the Walls, Tic Tic Boom!, Little Red Lung and Owls will be on the same stage at The Other Door Bar in North Hollywood, on August 3rd. It’s like the musical gods read my twitter message and made this HAPPEN!! Hey a girl can dream! But not only will the above mention will be there they will also share the stage with Okapi Sun (saw them a few months ago at the Wires residency and they were GOOD! ), Lost on Purpose and Bambi & Felix. The doors open at 3pm which will mean a nice afternoon of music! Take a moment to check out the links below!! And if you want more information please head to The Other Door Bar website! The lineup has changed a little….. Young Creatures will take over the 3:00 pm time slot, replacing Bambi & Felix. If you haven’t already check out Young Creatures.